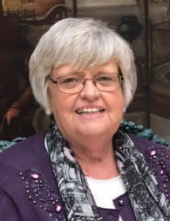 Elaine Clark-Gaffney, 74, was raised into the loving arms of her Lord and Savior on Monday, February 4, 2019 after a long illness. She was born in Utica, NY on April 21, 1944, a daughter to Leo Aloysius and Anna Millson-Clark. Elaine was a graduate of Whitesboro Central School, Maria Regina College, and Utica College of Syracuse University. Following High School graduation she entered The Sisters of St. Francis, Third Order, Syracuse, NY and lived the life of a Nun for seven years a vocation she always cherished but returned to laity in 1970 after Vatican II. She taught at Holy Family School, Fairmount, and Our Lady of Lourdes School, Utica, NY. She later left teaching and joined the General Electric Co. AESD on French Rd. and worked in various capacities there until she resigned to become her mother’s caregiver when her mom was dying of cancer. She was a long time member of St. Paul’s Church in Whitesboro, NY. In 1980, Elaine met the man who shared her same values and love for the Lord and who would become her loving husband. She married Deirmuid Joseph Gaffney at St. Paul’s Church, Whitesboro. Together they shared 26 happy years until his death in 2006. He was her gift from Heaven. It was because of him that she became a step-mother to his three wonderful children, a joyful fulfilling life to the end. Elaine was a quiet person who loved others and never found anything she didn’t like in someone. She loved her family and enjoyed watching their achievements throughout the years. She enjoyed reading, playing the piano keyboard, entertaining at Nursing Homes, golf and summertime trips to the Adirondacks. Birdwatching and feeding the birds was her daily joy. Survivors include her three step children; Michael & Terrel Gaffney Bedford, TX. Ann & Bob Meigs Clayton, NC and Patrick Gaffney Framingham, MA. She leaves a brother, Robert & Valdean Clark of Murrells Inlet, SC, a brother-in-law Kevin and Elizabeth Gaffney of Bridgewater, CT. and an aunt, Agnes Millson, Albany, NY. She will also be missed by her niece, Lori Clark, SC. and a nephew, Scott Clark SC. And her great niece and godchild Ashley Clark Oneida, NY. In her final days, it was her nephew & niece Mike and Susan Campion, Waterville, NY who became her angels to assist her in every way until death. Her niece and nephew, Brian and Joyce Dunn, Liverpool, NY greatly helped Elaine’s understanding of the disease. She also leaves her cousins, Tom and Joan Clark of Chittenango, NY. Elaine had a wonderful supportive group of friends who she cherished dearly and who supported her throughout her illness including Sr. Lois Pcaiello and Peg Waterman who was her friend for more than 50 years and was like a sister to Elaine and was with her during her final days. Funeral services will be held on Saturday at 9:30 AM at St. Paul’s Catholic Church in Whitesboro where a Mass of Christian Burial will be celebrated by the Rev. Thomas Durant. The family will greet visitors at the conclusion of the funeral Mass. There will be a viewing in Church one hour before the Mass from 8:15 AM to 9:15 AM. Arrangements are with the Dimbleby Funeral Homes Inc. Forty Main St. in Whitesboro. To plant a tree in memory of Elaine Clark-Gaffney, please visit our Tribute Store. "Email Address" would like to share the life celebration of Elaine Clark-Gaffney. Click on the "link" to go to share a favorite memory or leave a condolence message for the family.